Organizes monographs alphabetically by generic drug name to allow for fast retrieval of needed information. Includes comprehensive drug monographs containing generic names, Rx or OTC designations, pronunciation, U.S. and Canadian trade names, functional and chemical classification, pregnancy category, controlled-substance schedule, do-not-confuse drugs, action, therapeutic outcome, uses, unlabeled uses, dosages and routes, available forms, adverse effects, contraindications, precautions, pharmacokinetics and pharmacodynamics, interactions (including drug/herb, drug/food and drug lab test), nursing considerations, and treatment of overdose. Provides concise, practice-oriented nursing considerations: assessment, nursing diagnoses, implementation, patient/family education, and evaluation. Highlights IV drug information in one easy-to-find place, under the Implementation heading, including special considerations and Y-site, syringe, and additive compatibilities. Identifies high alert drugs that pose the greatest risk for patient harm if administered incorrectly. Features a nursing alert icon identifying considerations that require special attention. Highlights common and life-threatening side effects for easy identification. Provides special Do Not Confuse headings so you can avoid administering the wrong drug. Includes Tall Man lettering as recommended by the FDA to distinguish easily confused drug names. Includes Therapeutic Outcome headings in monographs to encourage critical thinking and provide a focus for the plan of care. Offers 16 full-color illustrations that show mechanisms or sites of action for select drug classes and a full-color atlas of medication administration, including a review of Standard Precautions, to clearly depict key steps in safe and effective drug administration for various routes. Includes extensive interactions information for drug-to-drug, drug-to-drug category, drug-to-herb, drug-to-food, and lab test interferences. Features pharmacokinetics and pharmacodynamics in chart form where appropriate for easy access to information. 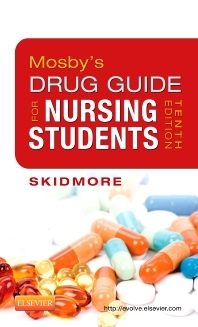 Includes a Drug Categories section with nursing diagnoses, generic drugs, and highlighted key drugs in each category. Offers a handy Safe Medication Administration Guide tear-out card in the back of the book that also includes a nomogram for calculation of body surface area. Designates Canadian brand names with a maple leaf. Offers a flexible, water-resistant cover for durability in the clinical setting. Includes free online updates with the latest FDA drug alerts, new drug monographs, tables of recently released drugs in the U.S., a listing of high-alert Canadian medications and controlled substances, English-to-Spanish translations, a comprehensive drug name safety reference, drug dosage calculators, and links to other drug-related websites.